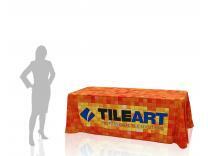 Used extensively with trade show exhibits and point of purchase display stands everywhere. 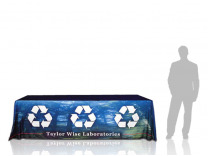 Not only do table throws and runners add a level of professionalism to the table top display presentation, but can also can play a key roll in helping to brand the product or service being presented. 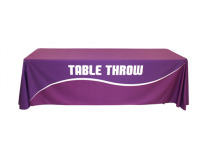 Table throws come in a wide assortment of wrinkle resistant fabric colors, are often machine washable and can be ironed. 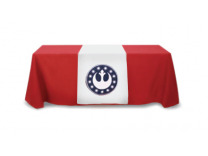 At the very least, a solid color table throw or runner will not detract from the message being delivered by the table top display that's sitting on top of it. 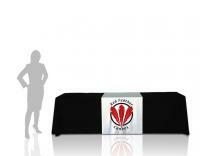 Table runners and throws also can be purchased with the organizations' logo or tag line on it. 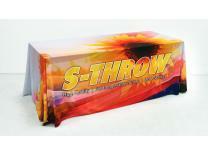 This allows the organization to reinforce their sales message not only on the display stand but also on the table throw. There are several different way that logos can be added to a simple table throw or runner. The first method and most often used is called the Perma Logo process. An exact likeness in vinyl of the logo is transferred to the fabric under high temperatures. This is similar to what you'd see on football jerseys etc. It's very durable and looks great under repeated use. 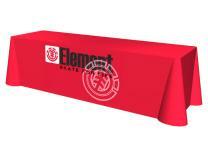 For an additional cost, you can add more than one color to your logo on either throws or runners. The only shortcoming in this method is that your color selection is limited to the vinyl colors that the manufacturers make available to the industry. 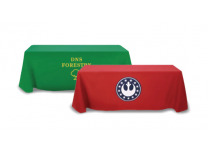 For larger areas of a table throw that need to be printed upon, the most often used application is Dye Sublimation. Again, it's a heat process that transfers ink into the fiber of the fabric, creating a permanent bond.